My reviews are usually uber-verbose, I know. 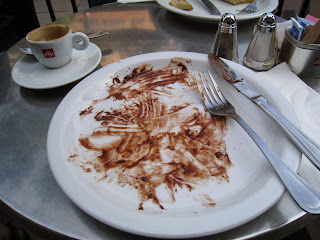 So, I thought I'd mix it up a bit with this one and just provide the basics: date (Sunday), location (Cafe Crepe Santa Monica), and dish tried (Nutella and banana crepe with Grand Marnier - $9.25 - I skipped the hazelnuts) - and let my pics tell the rest. Yep, that good. Had a single shot cappucino ($3.25) with it (Illy coffee is my fav!) and the pairing was divine. We sat outside as it was a gorgeous day, but the decor inside is great as well - dark paneling with vintage French posters. Those in a rush can also just do a 'grab n go' at the counter - the crepe is folded into a very portable triangle and served in a wrapper for easy nibbling while on the go. 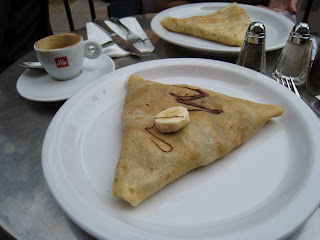 Word of warning though - their dessert crepes seem to be a lot tastier than their savory ones - my friend had the Europa Ham and Emmental cheese crepe ($6.75) and it was pretty bland. Great place to have casual brunch / dessert / coffee if you're already in the area! With all the hype surrounding the newly redesigned Santa Monica Place, and its high-end rooftop dining (which now ingeniously allows people to enjoy the nearly year-round gorgeous beach weather! 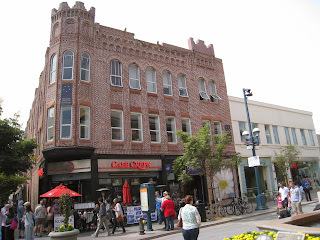 ), we were very much looking forward to checking out each venue. When LivingSocialLA recently posted a deal for Zengo, offering $50 worth of food/drinks for $25, we knew that was our cue for the first place to visit. Though we neglected to make reservations in advance, the friendly hostess secured a table for us within minutes. Strolling down the hallway next to the exquisitely decorated, airy La Sandia (and making a mental note that that would be our next stop), we arrived at a second hostess desk placed towards the front of the mall and the promenade - and were given a choice to be seated inside or outside. 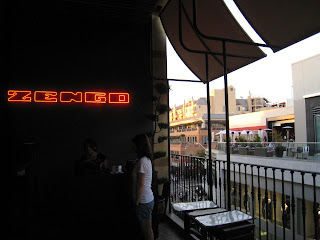 At our table on the terrace, our waiter explained (reinforced by an intro at the top of the menu) that "Zengo translates to give and take" - referencing the small plates designed for sharing, and the kitchen culture of delivering plates as they're ready. What we would discover in the course of dinner on a Sunday evening, is that Zengo 'gives' you an incredible rooftop terrace dining in a space with chic interior design through and through, and great service without attitude, but 'takes' away from the foodie experience that you would expect, with the inconsistent quality of its dishes. Both the main dining room, with its sleek, black decor tempered by warm, luminous bead-shaped bulbs that hang from the ceiling, and the rooftop terrace opening out into the Santa Monica skies and overlooking the entry-way to third street promenade, are absolutely breathtaking. Our waiter gave us a minute to soak in the views, then tempted us with intriguing cocktails including a Tamarind-Togarashi Margarita ($11) - a tamarind margarita with a Japanese chili salt rim. We had unfortunately already been drinking at the Abbott Kinney Festival earlier in the day, and had to pass on more alcohol - but made a note to try this next time. ﻿﻿﻿As we were starving, we dove right in with a Seafood Ceviche ($13) starter - which came on a plate with two separate bowls, one filled with shrimp, octopus, calamari, aji panca,heart of palm, orange and serrano, topped by bonito flakes, and the other with fresh fried plantain chips. This little dish was packed with incredible layers of flavors - the marinade for the ceviche was so good that we wanted to drink it after the seafood was gone! 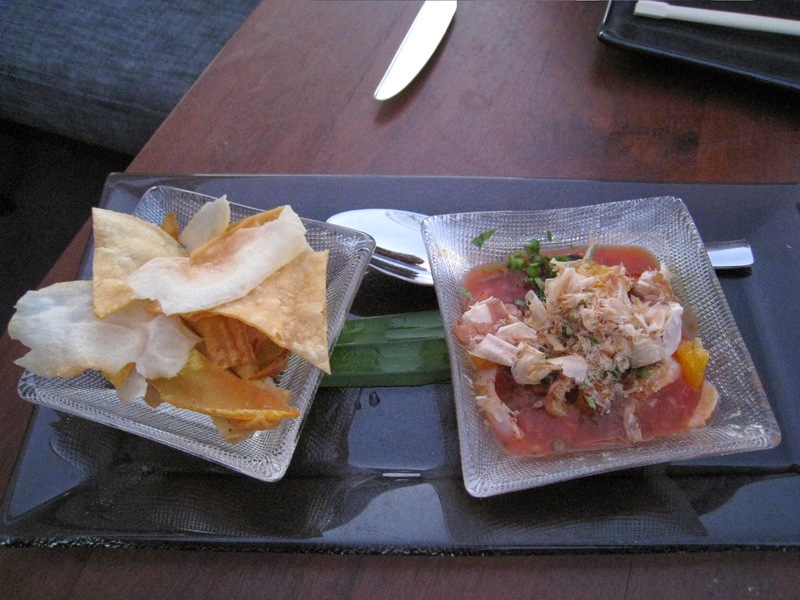 The chips were also at the perfect thickness and crispiness, and was an ideal companion to offset the chewy and soupey textures of the ceviche. Seeing the reference to foie gras in the Hot & Sour Egg Drop Soup ($7) - in the form of pork dumplings complemented by enoki mushrooms and green onions, we had no choice but to try it. This starter however was disappointing - the key to a good hot & sour soup is balance, and this soup base was overly salty and intense (too much soy sauce and vinegar? 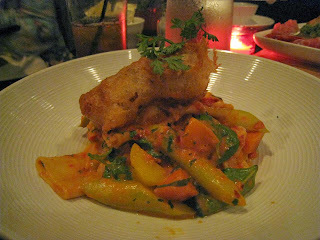 ), overpowering the flavors of all the other ingredients in the dish. I could not taste the foie in the dumpling at all, nor the pork, and the dough wrapper was tough and chewy - telltale signs that the dumpling, or at least the wrapper, was not freshly made. It also didn't help that the whole thing came in a bowl that was about a 1.5 cup serving size - where we could have easily gotten 5 times that portion at any decent Chinese restaurant in town for the same price - and it would have exhibited 5 times the skill in controlling the balance of flavors. 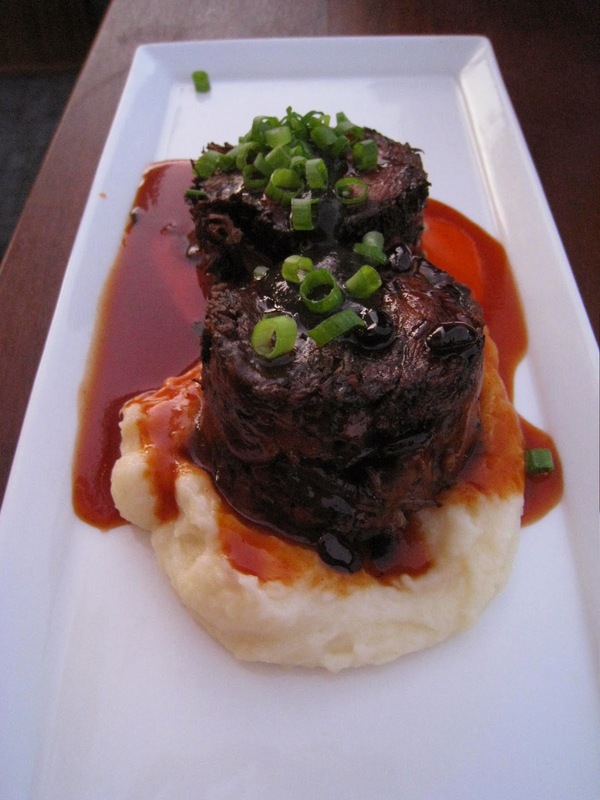 ﻿﻿﻿Our next small plate: Grilled Beef Short Ribs ($14) with manchego cheese potato puree, hoisin-adobo, dragon sauce and huitlacoche. The beef was tender, coming apart even as we lifted them with our chopsticks. The sweet, salty and slightly spicy flavors were intricately woven in the different sauces, which we loved - but which also unfortunately only reached the top layers of meat. This dish only delivered on the first few bites - once we got to the middle of the beef tower, the wonderful flavors completely went MIA. ﻿ Having picked a dish "From the Land", our next plate was "From the Sea" - Chipotle-miso Glazed Black Cod ($16) with daikon radish and lemon-togarashi aioli. This was easily the best-of-meal dish, slightly crisped with browned sugary edges, and juicy and tender overall, flaking away at the bare touch of our chopsticks. The daikon radish added a nice crunch to counterbalance the texture of the fish, and unlike its 'land-locked' counterpart, the fish was infused with flavor throughout, and the aioli added a nice kick. At our friendly and attentive server's suggestion (he noticed when my Arnold Palmer was finished and brought a refill immediately without me having to ask!) - we also ordered Wok Fried Rice ($8 - not pictured) to round out the meal - the rice was packed with duck, shrimp, pork, egg, carrot and scallion - and was a good complement to the other dishes, though again portion size was very small - enough for two people only as sides. But we made the choice to spend the extra $3 to get the fried rice rather than plain jane jasmine rice for $5. Though the portions were small for the price, we did find that between the two of us, the two starters, two small plates and fried rice was enough to leave us stuffed at the end of the night, with no room for dessert. And of course, we were happy that after the $50 LivingSocialLA certificate was applied, we only had to pay $30 extra including tip. All in all, Zengo was indeed a give and take experience - we loved the culinary adventure in concept, with the introduction of ingredients we haven't encountered, or encountered in that combination, in other LA venues before - and enjoyed the incredible rooftop dining space, great ambience, and friendly, attentive service, but the execution of the food was uneven, and were it not for the saving grace of the LivingSocialLA certificate, we would have felt the sting of haute cuisine prices more sharply. Zengo may serve as a great spot for drinks with friends or a date for the ambience alone - but serious foodies, at least for now (perhaps the food will improve over time), are better off 'giving' their money to other takers. Sweepstakes alert! Win Trip to Next South Beach Wine & Food Fest! To celebrate the release of the South Beach Wine & Food Festival Cookbook, Tasting Table is running a sweepstakes offering a grand prize of a trip to attend the next festival in Miami! There are also tons of great secondary prizes include champagne, cruises, wine glasses and more! Enter now through November 15, 2010 11:59 p.m. ET! Limit one (1) entry per person. This Sweepstakes is open only to permanent legal residents of the fifty (50) United States and the District of Columbia, who are twenty one (21) years of age or older at the time of entry. See Official Rules for details. Check out my Sweepstakes Page "Win Your Next Bite" - for more awesome promotions! At just over a month after its soft launch, all signs point to Lardon being much more than just a 'flash in the pan' on the LA Food Truck scene - like the greasy but supertasty browned bits in the crannies of cookware after bacon's been on the hotspot - Lardon is here to stay. It's already got its hold on the city, or at least those who have been lucky enough to try it. As a devout bacon-ist, ﻿﻿﻿﻿﻿I had been keeping tabs on Lardon via Twitter since news broke of this exciting new food truck concept. They recently started serving three meals a day, but it was often close to my apartment while I was stuck at work - or just out of reach, a little too far for me to sneak out to at lunch. And I hadn't seen it yet on food or art fest circuits. So last night, it felt like I had won the lottery, when I noticed it would be just a short drive down the street at dinnertime. I tried to finish up at work and get out as soon as I could, knowing from Twitter updates they were already out of most items halfway into service, due to locals going hog-wild for their offerings. Arriving to a stretch of Riverside Dr on the Burbank/NoHo border 10 minutes after the truck was scheduled to take off, I was relieved to spot Lardon still parked by the curb. A handful of people were chatting on the sidewalk, and I walked up with a mix of dread (what if they are from Lardon, getting a quick break before packing up to leave?) and cautious optimism (perhaps they would indulge me in one small morsel before closing down for the night?). I stepped up to the window, but my heart sank when told they were out of absolutely everything...the folks on the sidewalk had been waiting a long time for the last of the food. The guy handling the orders (who I later found out was owner Jeremiah) - saw my disappointment and offered a brownie for my efforts. Instantly cheered up, I started to reach for the money in my backpocket when he said the magic words: "Don't worry about it, it's on the house!" Then he asked co-host Heather to pull brownies for everyone. Awesome, I thought, and stepped to the side to wait and check out the menu that I planned to try next time. 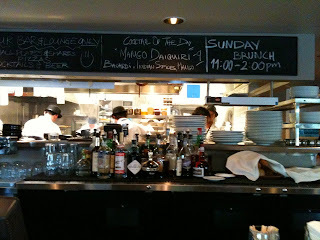 Then they kicked it up a notch - the chef found a straggling 'baco' - did I want it? Did I want it!!?? That made my night!!!! So I pulled out money again, ecstatic about the chance to try the 'baco' after all - which is what I would have ordered in the first place! As Jeremiah waved the money away, I tried to object - I couldn't possibly take a brownie AND a baco for free!!! But he insisted the baco would also be on the house. 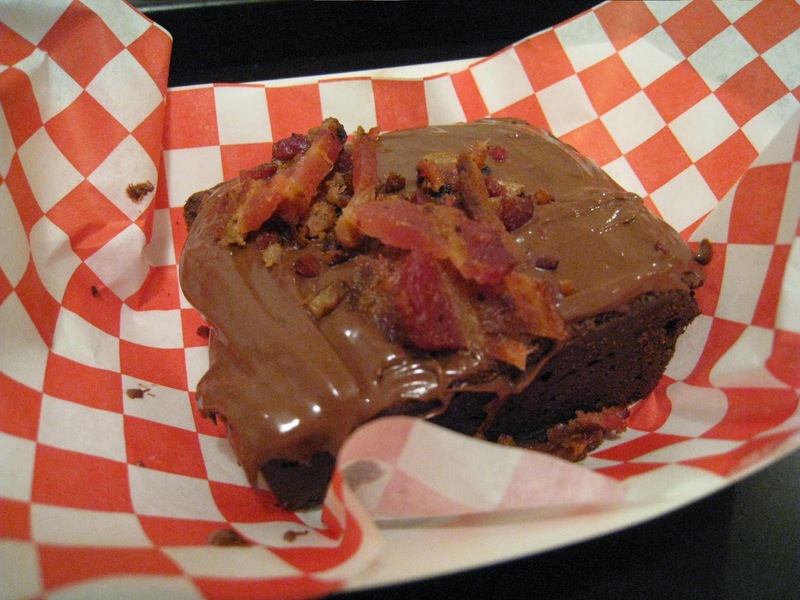 I couldn't believe it - BACON + Nutella + Brownie, and it's all free - all in one night. (And I have to be clear here that at NO time did I ever mention that I have a blog - to Jeremiah and Heather I was just a regular customer). I am now a fan for life. Can they be any nicer??!!!! I challenge anyone to find a more perfect couple in all of the food trucks in LA!!! So, sorry for the uncharacteristic rambling of the circumstances of my arrival at this particular review venue - but it was too awesome not to recount. On to the food then! ﻿So what is "the baco" ($4)? The concept is sort of like a bacon taco / savory crepe - except that a bacon 'shell' is used instead of a tortilla or crepe as the wrapper, and potato and cheddar are used for stuffing, all served in a plastic cone-shaped cup. The 'platter' comes with a side of horseradish sour cream topped with bacon bits! The baco fulfilled two of what in my humble opinion are the keys to great street/food truck food - (1) it has to SMELL amazing - street/food truck food is an up close and personal experience, with a sense of immediacy that you don't get from most restaurants (unless you sit at the bar right in front of an open kitchen) and I like to first be lured by enticing smells. Lardon definitely gets this, and the smell of bacon cooking pervades the entire block where the truck is parked - it's impossible to NOT notice that it's there, and to be drawn to it like the puppy from the Beggin' Strips commercials - except that this really IS bacon!!! (2) it has to be designed to be easy to eat standing up in the street, without a counter or silverware. Anything that requires both a knife and fork to eat, even plastic ones, should not be served off a food truck (unless they are also providing tables and chairs) - anyone who has tried to balance their tray of food in one hand while trying desperately to cut food into bite-sized pieces with the side of a plastic fork in the other would understand. The 'baco' was served up perfectly - you just toss the little container of sour cream over the whole thing, and then grab the plastic cone-cup (which protects you from the delicious and minimal, but potentially messy grease) in one hand and munch away. In terms of taste, the baco was divine. The proportions of potato to cheese to bacon shell was just right, and I loved the layered textures of the soft, creamy but substantial and mild flavored combo of potato and cheese inside with the crunchy and salty bacon shell enveloping the whole mix. My only minor note is that I would have liked the horseradish flavor to have a little more presence in the sour cream mix, but overall I loved the concept and execution of this bacon taco. ﻿And for dessert...the Lark brownie with bacon Nutella spread ($3.50) - or, as far as I'm concerned, the dessert that delivers on three essential food groups: chocolate, bacon and chocolate-hazelnut spread. This brownie will make you a believer in Lardon - over a moist, dense brownie from Lark bakery in Silverlake, Lardon has ingeniously slathered creamy Nutella chocolate-hazelnut spread as 'frosting', and topped the whole thing with bacon bits for a kick of saltiness to complement the sweet. The portion size is also generous, so that I felt full after the baco and the brownie, and didn't have to eat anything else for dinner afterwards! All in all, I will definitely be keeping a lookout for Lardon on Twitter, and treating their menu like a checklist. 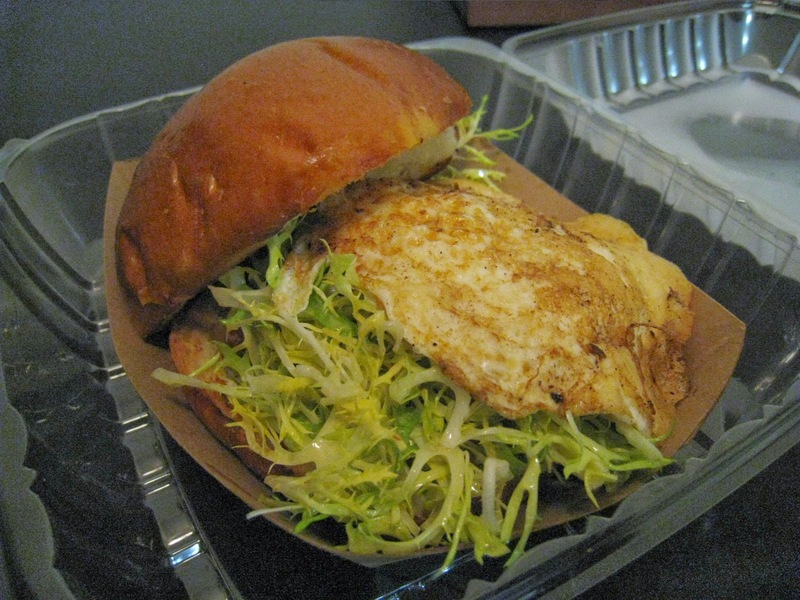 The next thing I think I'm going to try is the frisee au lardon sandwich with a fried egg and vinaigrette on toasted brioche ($6)...though the breakfast items look tasty as well...if they don't sell out before I get there, a risk that I am sure will only increase as more people hear about this incredible little truck!!! Great work, Lardon - keep it up!!! 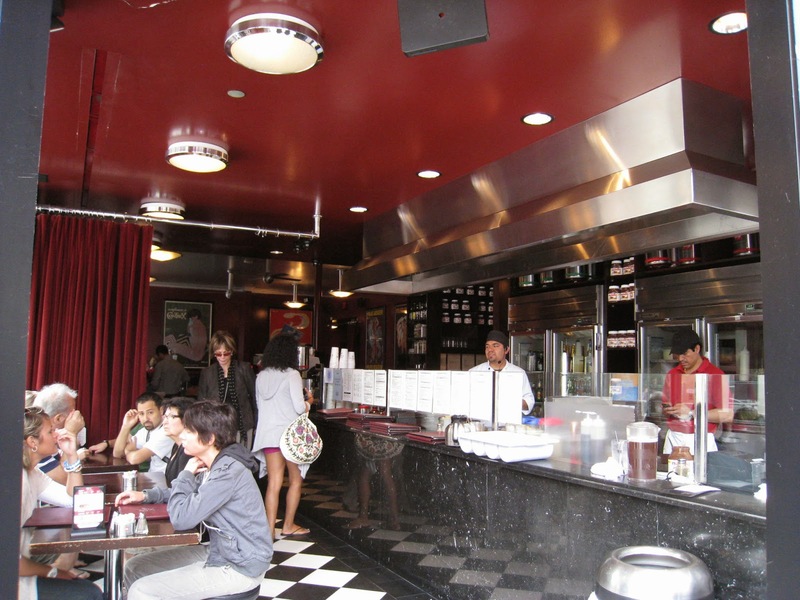 Update Nov 2010: Tried the frisee au lardon sandwich - it was awesome! Great balance of the frisee with the runny egg, punctuated by salty bacon chunks - my only note is that there was a little too much bread in proportion to the 'fillings', but very minor. 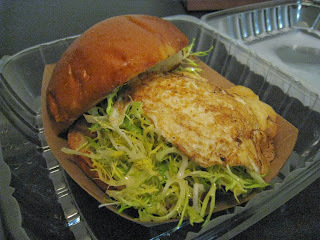 Overall it's a great, tasty little gourmet sandwich for $6 - served with a side of friendly service! 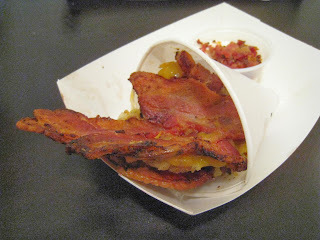 Update Dec 2010: With visiting Canadians in my house, I couldn't let them leave without checking out the great American way with bacon - in combo with the food truck craze. We ordered one of everything that was left on the main menu, as well as bacon pancakes with bourbon maple syrup ($5.50) and brioche french toast sandwich filled with crumbled bacon and bacon bourbon maple syrup ($5.50). 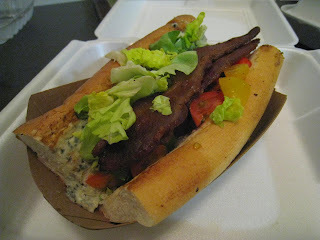 My brother and his wife loved the frisee and baco as I did, and the BLT was fairly good as well. The french toast and pancakes had likely just gotten cold by the time we got to them, after all the picture taking, driving back home and gorgefest on the mains, but those items were a bit overshadowed by the beauty of the frisee and baco. 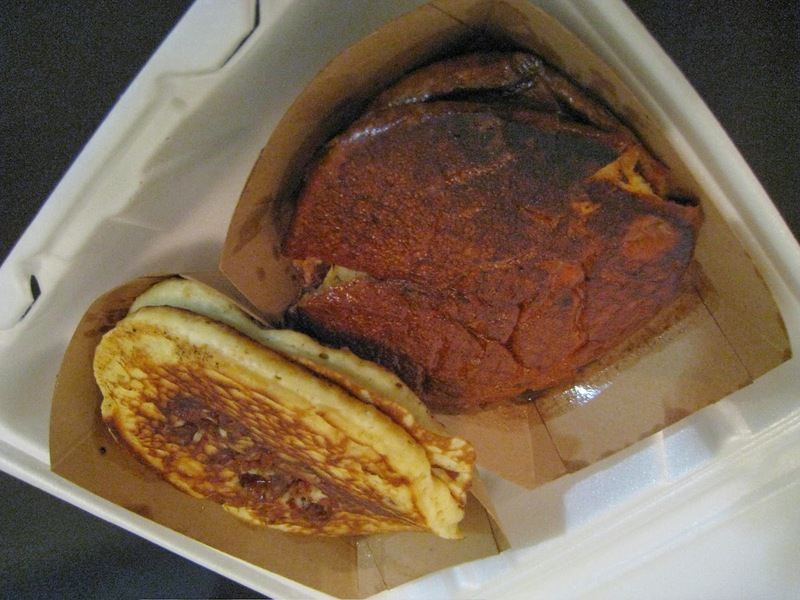 Also, I had expected for some reason that the pancakes would actually be made of bacon flavored batter - but could not taste bacon beyond the crumbled pieces that seemed to be tossed in quickly to the center of the griddle cake. All over L.A. - track them on Twitter! Sweepstakes Alert! Win a 2010 Sub-Zero Dream Kitchen Worth $30k! Limit one entry per household. Open to: legal residents of the 48 contiguous United States and District of Columbia. See Official Rules for details. Share Our Strength's Great American Dine Out Kicks Off Today! Calling all foodies - dine out this week for a good cause! From today, September 19 to Saturday, September 25, thousands of restaurants from all tiers across the country are offering great promotions, featuring special dishes, and/or donating part of their proceeds from the week to help support Share Our Strength's work to end childhood hunger in this country. Joe's Crab Shack: Buy a 'No Kid Crabby, No Kid Hungry' t-shirt and proceeds go to Share Our Strength. Or, make a $1 or $5 donation and get a coupon for a free piece of Key lime pie or an order of crab nachos next time you visit. Get more details and find the many participating restaurants near you here! My first encounter with Todd English was at the Pebble Beach Food & Wine Fest a few years back, where his team served up pork belly in citrus marinade on the most amazing flatbread. It made such an impression that when he opened up Beso with Eva Longoria in Hollywood, we had to go and try it too, despite lukewarm reviews and widespread skepticism about the quality of yet another celebrity food venture. 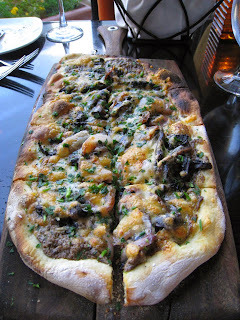 Beso's flatbread definitely gave the one from Pebble Beach a run for its money. And I loved the decor, with its rich dark woods, amber scheme and giant chandeliers looming overhead all coming together to provide a very lush, romantic setting. 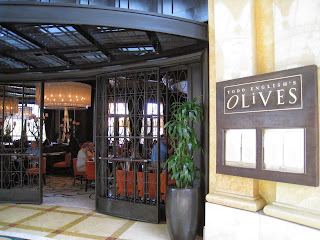 So, while in Vegas this summer, one of the first stops to land on my itinerary was Todd English's Olives at the Bellagio, famous for its celebrity chef and modern Mediterranean fare, as well as its spectacular views of Lake Bellagio, and the hotel's famous water show. Three of us made the pilgrimmage on a sunny Sunday afternoon, and were seated right by the floor to ceiling windows - the view is indeed great, with water jets spouting 3-4 stories high seemingly right next to us, sporadically throughout our meal. I also loved the restaurant's interior design, which, like Beso, used a lot of dark woods, and a warm, inviting color scheme - but its chandeliers are more modern and sleek looking, with amber fabric covers. Our meal was prefaced by a trio of olives and olive tapenades that came with a basket of bread. In my experience, one of the most reliable early signs of how good the food will be at a restaurant, is the quality of their bread - if they take the care to ensure it is fresh, and served at the right temperature, it says 'anticipate great things ahead'. 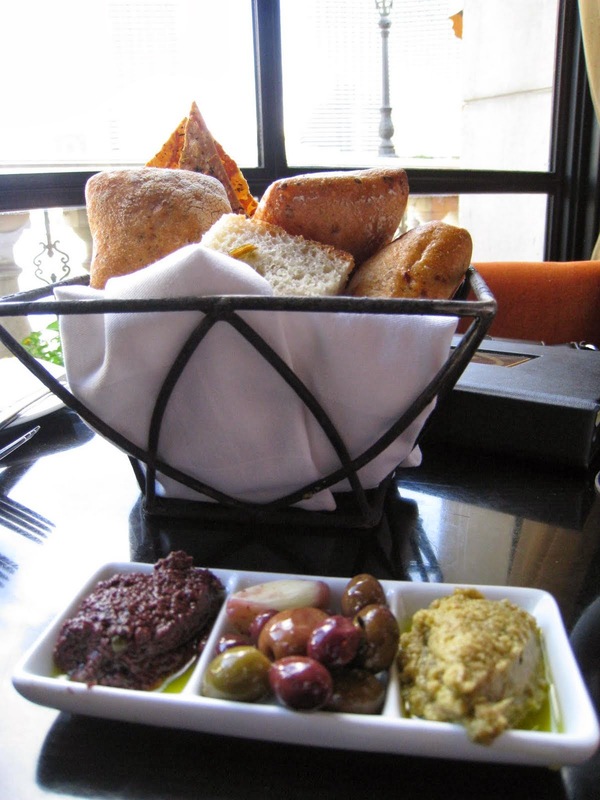 Olives served up a basket of cold bread that tasted like they were baked at least a day ahead of time. The tapenades were far too briny, and had a bitter aftertaste, which is unfortunate as you would reasonably expect any dish that served as / came of the restaurant's namesake would be served at a much higher standard than the rest of its menu. Thankfully, this hors d'oeuvre was free. For a starter, our eyes immediately flew to the Portobello Flatbread ($17), made in a traditional wood-oven with wild mushroom purée, herb roasted portobello, red onions, fontina cheese, and white truffle oil. 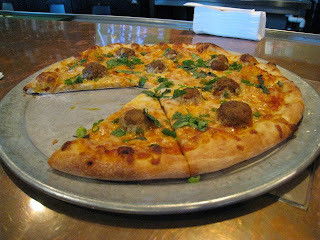 The truffle oil on the flatbread transformed us instantly into truffle hogs - we INHALED this one. 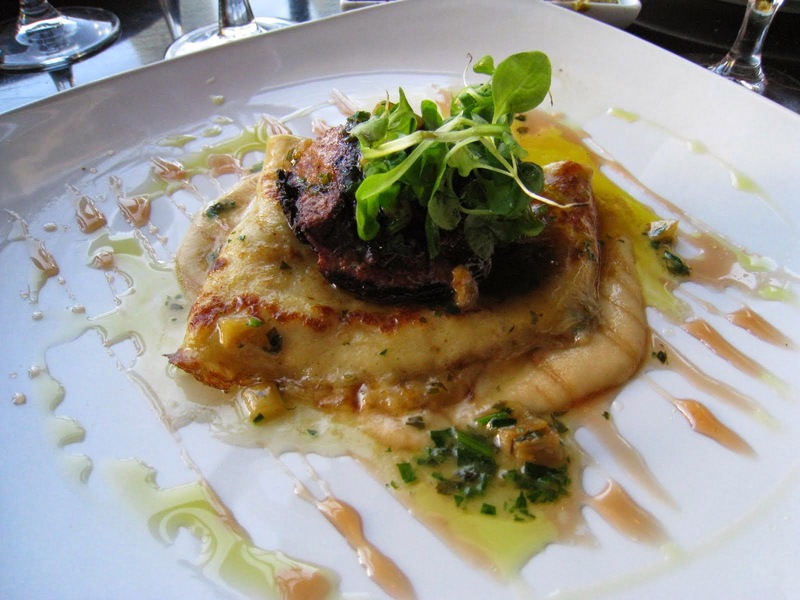 The puree was creamy, while the juicy portobello pieces provided something substance - the different textures and flavors enhanced the mushroom theme and brought out the truffle oil, while the steaming fresh flatbread served as the perfect canvas for the mix. This flatbread easily takes the 'best in show' prize for our meal. To balance out the heavier meat entrees to come, 'Birthday Girl' ordered the Boston Bibb Salad ($13) which came as a big wedge of lettuce with a smattering of shaved white onions, toasted walnut dressing, and a "shower" of maytag blue cheese. The third in our party, "Foodie Mentor's Sister", and I practically got whiplash from flitting between the pages of the menu, excited by the creative sounding descriptions. We decided to share two starters so we can sample more dishes. The first was Carpetbagger Oysters ($25), which scored major points for presentation - they looked like elaborate oyster creations that happened to wash up on a sandbar, in a perfect line. To breakdown the elements of the dish - truffle mash is stuffed in oyster shells, then sitting over the stuffed shells are crispy fried kusshi oysters wrapped in beef carpaccio, topped by a dollop of spicy aioli, all sitting on a bed of salt. Unfortunately, the taste did not live up to the expectations built up by the visuals. 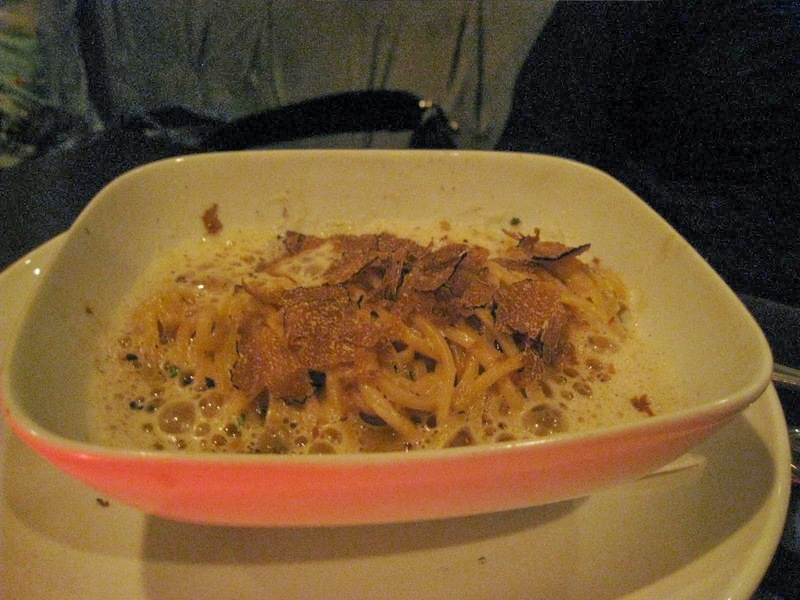 The truffle mash tasted bland, and...waxy! Scooping the mash out with a spoon was like picking wax out of...ok, I won't finish this sentence, as this is afterall a foodie blog and that's not very appetizing! 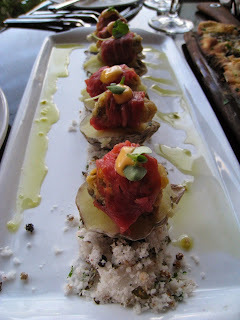 The oysters and beef were equally flavorless - we understood the aioli's function was to give a kick of flavor, so we popped the whole contraption in whole - as an amuse bouche - to see if that would make a difference. The aioli registered as spicy, but the oysters and carpaccio, which formed the bulk of that mouthful were not enhanced by the drop of aioli - in terms of taste, they remained disparate parts - you taste the aioli, and then the bland nothingness of the oyster wrapped in beef. I also tried adding a pinch of the 'sand' (coarse grain salt), but that was also fairly mild and didn't do much for the dish. It's too bad, as I really wanted to be madly in love with this dish - the level of disappointment is similar to meeting a guy that looks amazing and interesting from across the room, and you start fantasizing how perfect it would be to date him - only to find out he has absolutely zero personality when you get up close! Moving on...our second starter was the Pan Roasted Foie Gras Steak ($26) with caramelized fuji apple silk, armagnac butter crêpes, pomegranate syrup, and mâche salad. Though the crepe was a little too dense and soaked in butter to provide a nice counterbalance for the richness of the foie, the taste and texture of the perfectly seared steak, with its smooth, delicate center, more than made up for the minor glitch. The sweet/tart combination of fuji apple slivers and pomegranate syrup nicely complemented the richness of the foie/crepe, and the mache salad added just the right touch of contrasting texture and lightness. This dish gets second 'best in show' for the meal, after the flatbread. Being on a budget has made me a more spontaneous and unconventional diner - I don't always have the luxury of following conventional decorums of wine, starter, entree, dessert. I pretty much order whatever sounds exciting on the menu, that I would want to try if this were the last time I get to eat at the place. 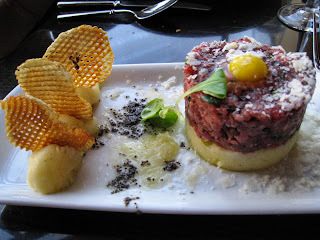 With that said, I ordered a third starter as my entree - unable to resist the lure of Kobe Beef Tartare ($19) with quail egg, waffle fries, evoo mashed potato, black truffle vinaigrette, and parsley. The flavors were amazing and infused evenly throughout the beef. The meat pieces could have been a bit more distinct (Petrossian's hand-cut steak tartare has ruined me for this dish anywhere else, in terms of texture), but it was an otherwise well executed dish, and the waffle fries provided a nice decorative touch. 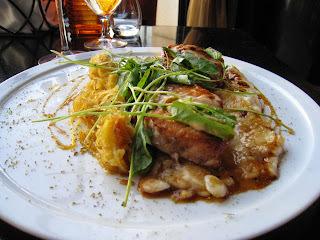 The last dish I will review here is 'Birthday Girl's entree - Kurobuta Pork medalions ($34) with whipped apple mousseline, confit fennel, roasted spaghetti squash, cider reduction, and watercress salad. Pork is always a challenge to get just right - it has to be thoroughly cooked for health reasons, but if you cook it even for just a little too long, it will become dry and tough. Olives did a great job with getting it just right with this dish. The apple/cider flavors are good complements, while the roasted spaghetti squash is an interesting side texture and flavor-wise (it was actually the first time I had spaghetti squash)! However, while a solid hitter, this one did not knock us out of the park - and certainly was not in our minds a $34 value! All in all, for this meal the quality was inconsistent - some of the dishes were great, some were solid, and some fell flat. 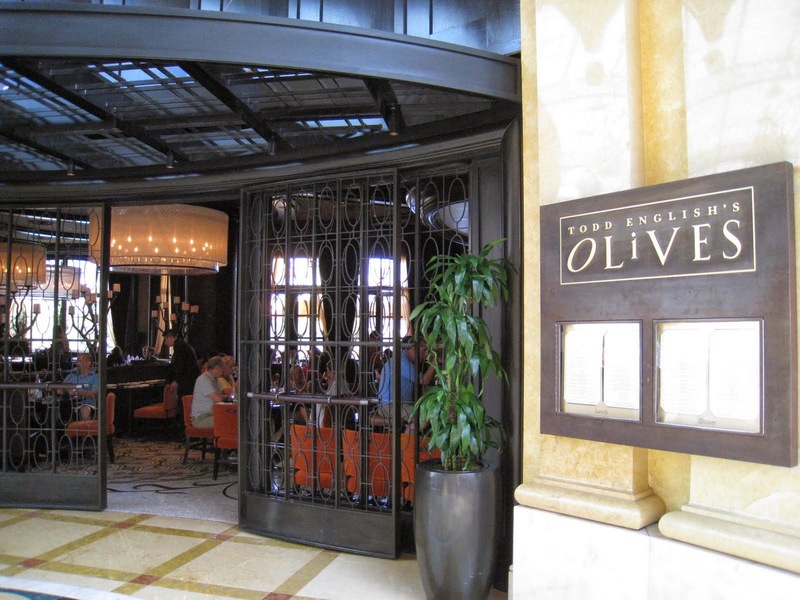 We concluded Olives is a great place to have a drink and a starter (Portobello Flatbread and Pan Roasted Foie Gras highly recommended! ), and to catch the water show from a relaxed environment out of the scorching desert heat. For the price of a full meal, the discriminating foodie on a budget would be much better served spending their money at Craftsteak - where the dishes are consistently amazing. Sweepstakes Alert! 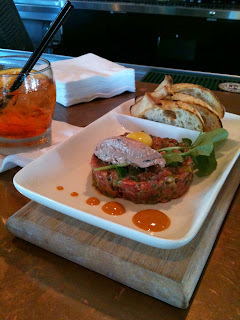 Win dineLA for a Year (52 x $100 gift cards)! Wish you could afford to try every single restaurant on dineLA's Restaurant Week list*? Check out the dineLA For a Year Giveaway, which kicks off today! Grand Prize: Collection of $100 gift cards for every week of the year (52 total) from select dineLA Restaurant Week participants. Enter starting today, Sept. 13, 2010 through Oct. 15, 2010, for your chance to win! 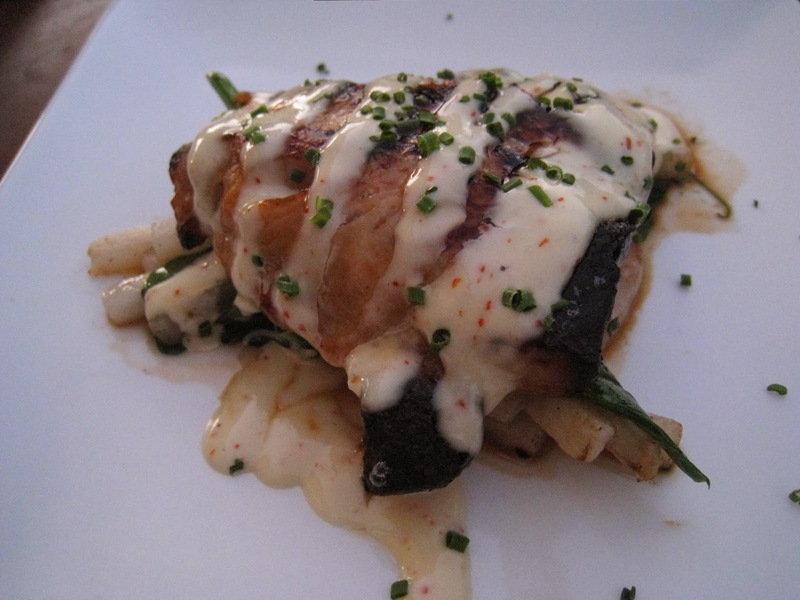 *You can see the list of restaurants participating in dineLA Restaurant Week, and their menus - as they are posted - here. 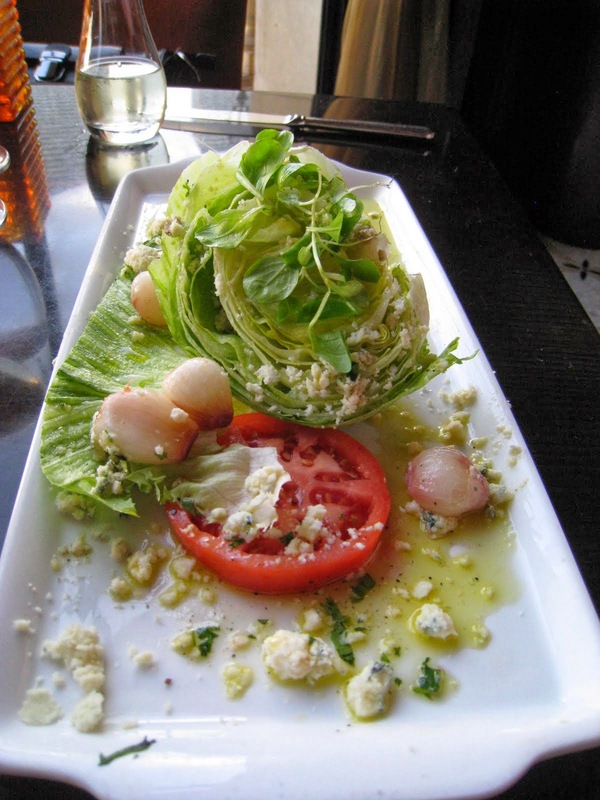 The Silverton name, in the LA dining scene, has been synonymous with amazing but accessible food, served in an intimate and relaxed setting. Nancy Silverton (of Osteria and Pizzeria Mozzas and La Brea Bakery) needs no introduction - but her sister, Gail Silverton, has also proven to be a force to be reckoned with - over in the valley, starting with Gelato Bar & Espresso Cafe in the heart of Tujunga Village in Studio City (just a few steps from Cafe Aroma). The concept is a mini Italian Piazza to provide a relaxing reprieve from the stresses of the city - and it works to charming effect. A stone fountain with water springing out of a carved lion-head provides calming background sounds, and a communal table/bench faces outward to the few tables on the street, providing a sort of window-seat great for people watching, while Italian cafe style rattan patio chairs line the small and cozy room. Small racks of imported Italian treats are sprinkled throughout the cafe, ranging from candies to chocolates to biscotti. On a sunny day, strolling down the stretch of Tujunga Ave that is home to quaint clothing boutiques and artisan cafes, you truly understand the meaning of bliss. 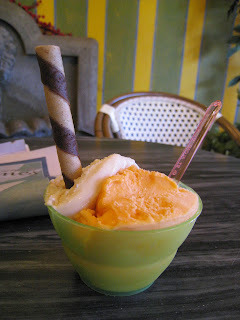 Take that over the edge with a cold treat from Gelato Bar & Espresso Cafe. My favorite flavor so far is one I have yet to see elsewhere: Mascaffe - a unique blend of mascarpone cheese with swirls of coffee woven throughout. The Tiramisu is also better than ones I've had at other places (I used to love Charley Temel's ice cream version of this flavor, but haven't seen them serve it in years - and it definitely is not of the same caliber as Gelato Bar's). Other flavors that have intriguing names include: Canella Basilico, Nutelle, PannaCotta and Limoncello. These form the basis of a new checklist of flavors I am determined to try before I die. Also on my list is the "Affogato" - though its literal translation, "drowned", is an interesting choice - the actual drink/dessert consists of a scoop of gelato with a shot of espresso poured over it, topped by whiped cream, and definitely has me drooling. I'm also keeping an eye on the sorbettos and sugar free gelato also available at the bar. Lastly, the Espresso Cafe of course also offers artisan coffees and teas, as well as a selection of fresh pastries. 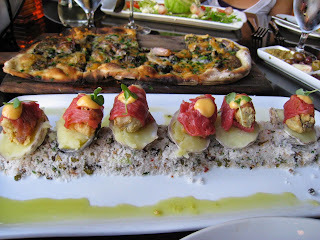 Those closer to Loz Feliz can also enjoy all these treats at the Hillhurst location. My only complaint with Gelato Bar & Espresso Cafe is the price - at $4.50 for the smallest size ("piccolo" - about a 1/4 cup serving) and $5.50 for a medium ("medio" - about a 1/2 cup), the gelato is definitely a 'treat' that budget foodies like myself can't afford to have often. I know this is artisanal gelato and completely in a different planet from the Pinkberry froyos of the world - and that I am speaking absolute blasphemy - but had it been a scorching summer day in LA, when a frozen treat's function as cooling agent eclipses its role as a sweet finish to a meal, I would probably take quantity over quality and opt for the medium sized Pinkberry instead ($4.95 at last check for about 1 cup serving size, plus unlimited toppings; $5.95 for about 1.75 cup portion plus unlimited toppings). Cost aside, Gelato Bar & Espresso Cafe offers a lovely place to spend part of your afternoon, and molto delizioso gelato that will keep you coming back for more. Waterloo & City is an unexpected name for a British gastropub, which has come to mean - to this blogger at least - an express train to the best Happy Hour for foodies on the Westside. An instant classic that recently joined the ranks of 'affordable gourmet' stationed in the bourgeoning foodie mecca that is Culver City, the place is named after a a railway line in the London Underground (aka "the Tube") - that only services two train stations "Waterloo", and "City" (for London City) - which, according to the website, is where Executive Chef Brendan Collins' initiated his youthful adventures. Waterloo & City's website also explains that it is a traditional British gastropub, which means "it has the relaxed, easy atmosphere of an English pub while serving extraordinary gastronomic cuisine." This for me translates into gourmet 'for the people', incredible food without the pretentiousness - a concept that I love. Waterloo & City has taken a former greasy spoon diner located just a mile or so south of the emerging dining scene of downtown Culver City, and transformed it to a sophisticated yet laid back venue, creating an inviting space with a wide open layout that maximizes natural light and allows diners to enjoy the almost always gorgeous SoCal weather. 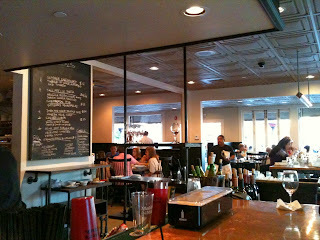 I personally love the hammered copper counter at the bar, which I have already made myself at home at on multiple occasions, for their abfab Happy Hour that runs DAILY from 5pm – 7pm (yes, that includes weekends!!!). A selection of refreshing pubtails are offered at $6 during Happy Hour, which are regularly $10-$12. I'm partial to The Westside - a mojito-inspired drink made with gin, watermelon, mint, and lemonade. My friend, who recently returned from a trip to Italy with a newfound love for Aperol - was delighted to find that Waterloo & City is one of the few places that serve the liquor in L.A., in the form of Aperol Spritz - a pubtail consisting of Aperol, sparkling wine, club soda, and orange. Wine and beer of the day are also available for $5 or $4, respectively. You can also order well drinks for $5 during Happy Hour. The drinks are a good deal, but that for me is not what pulls me in to Happy Hour time after time - it's the amazing small plates and gourmet pizzas at just $6-$9 each (all but the cheese plate, which is $12 for eight cheeses). Here are a few of the dishes that, at mere thought, have a Pavlovian effect on me. 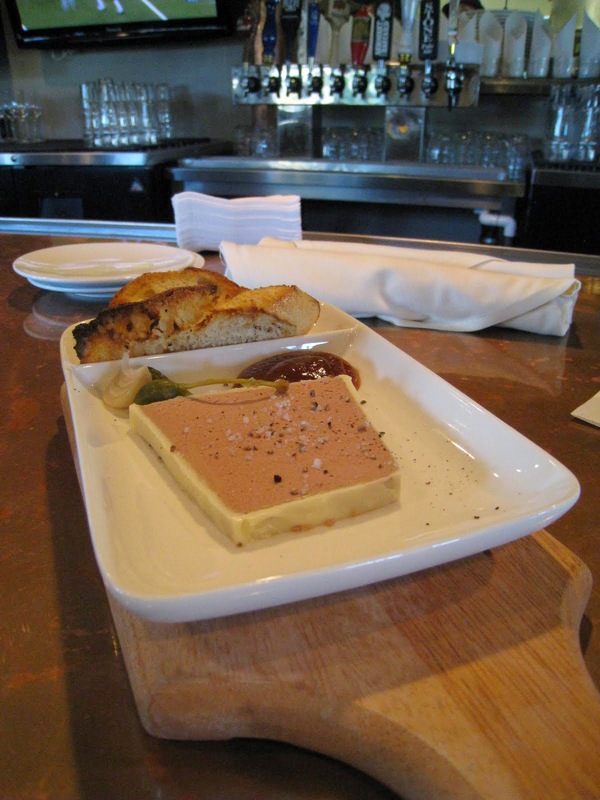 The Chicken Liver and Foie Gras Mousse, at just $7 - is an incredible deal. The same dish at dinner would be $12. Its smooth, creamy rich texture is offset by a sprinkling of coarse truffle and sea salt, and a trio of crunchy and sour sides (cornichon, pickled pearl onion, giant caper). The slab is perfect - my only suggestion for this plate is to offer more bread, as 3-4 pieces is simply not enough for the amount of mousse, unless you intend to pile on an enormous mound to each slice. Also, though it appears that the bread is fresh (there is a large amount of loaves sitting open in the serving area behind the bar - that don't look pre-packaged) - it tasted a bit too crusty. Given the quality of the mousse, I would have expected the bread to taste at least at the caliber of La Brea Bakery bread. The pizzas on offer are also amazing, with portions big enough to serve as meals in themselves. Types of pizza change from time to time, but my favorites have been the unique Moroccan spiced lamb meatballs, manchego cheese, with ras el hanout (and an amazing sauce tasting of layers of spices I can't even begin to name), and the hynoptic wild mushroom with smoked mozzarella and truffle oil. 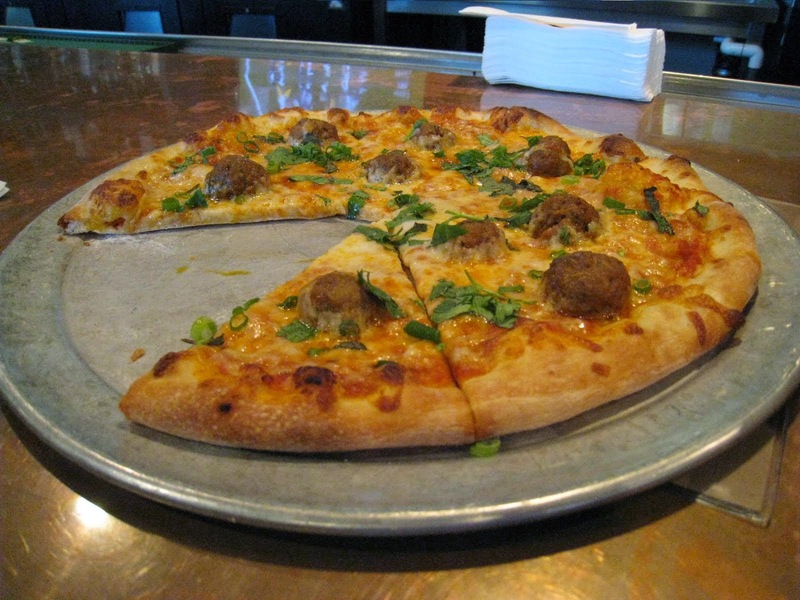 A steal at just $9 Happy Hour pricing ($13 regularly)! 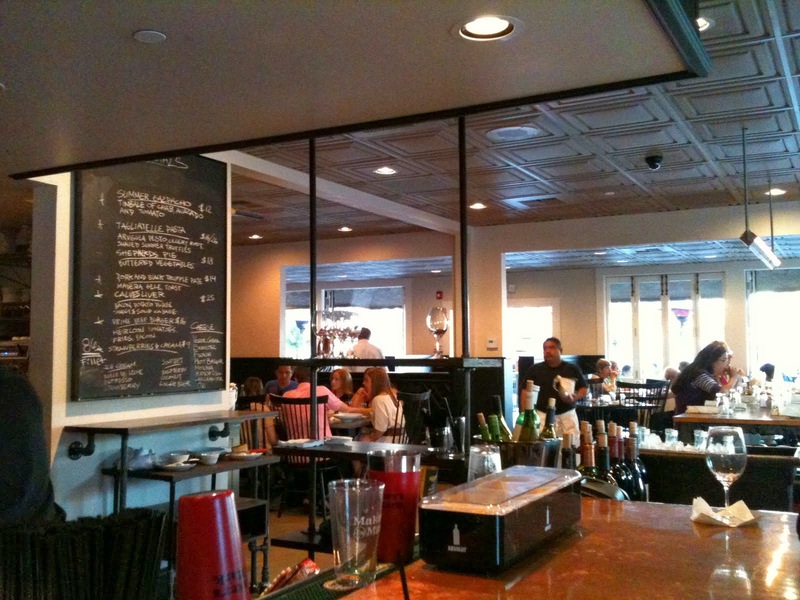 Waterloo & City also offers tons of blackboard specials - both for drinks and food. 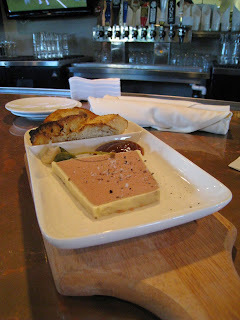 A recent highlight for me includes a jar of Hudson Valley Foie Gras Port Gelee and Armagnac Prunes, and Toasted Brioche. One of these blackboards sit over the opening to the kitchen, another reason I love sitting at the bar - it's strangely mesmerizing to see the muted bustling in the kitchen, and the owners have showed that they pay attention to every detail - all the kitchen staff are wearing bowler hats, which gives the visual an idyllic, charming sort of '20s look and feel and adds a bit of whimsy to the dining experience. Beyond Happy Hour, Waterloo & City also has a great dinner menu, with prices that are also fairly reasonable - though it is not as across-the-board consistently incredible as the Happy Hour menu. I was excited on a recent trip to see Steak Tartare on the list - served with truffle pork pate, quail yolk, and toast at just $13 for half portion, $18 for full. Though the pieces felt a bit mashed together and overall just a tad too oily for my taste (I have yet to find a place to top the steak tartare at Petrossian, which is handcut, with a ribbon of caviar woven through) - it was a great deal for the price, and the quail yolk, which is hard to come by, was a nice (and tasty) touch. Waterloo & City is also known for its charcuterie and terrines. 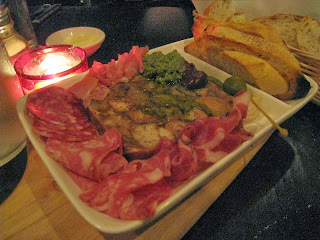 As I was with my 'Foodie Mentor', another adventurous soul, for dinner one night - we decided to try the terrine of pig trotters and sweetbreads, with salsa verde ($11). It was divine, though the flavor and texture of the sweetbreads could have been highlighted a little more - it was a little lost in the overall terrine, in my opinion. We also ordered up the "Commoner" chef's charcuterie plate ($17 - referenced as "Cured Meats Selection, Cornichons, Pickled Onions" on menu) - which came with prosciutto, salami etc. which all were amazing. Not entirely sure how we found room for additional dishes after the meat feast - but I did want to try the main menu - and my eyes immediately went to the Hand Rolled Tubes, Lobster, Fried Pork Belly, and Asparagus (small portion $14, full portion $20) since it was basically a mix of my favorite shellfish, favorite cut of meat, one of my favorite vegetables, and pasta! Despite my high hopes for this dish, unfortunately the sum of the ingredients did not transcend its parts - it didn't feel like the various components came together in a cohesive way. Frying the pork belly in batter ended up being sort of overkill - part of the beauty of pork belly is the lusciousness of the fat and the balance of that with the substance of flavorful meat. Putting batter around the whole thing overwhelms the textures and flavors of the pork belly so that you really only register the fried shell, before biting into the meat and fat which then feels like an unstructured, greasy mess. The pasta also felt just slightly overdone. 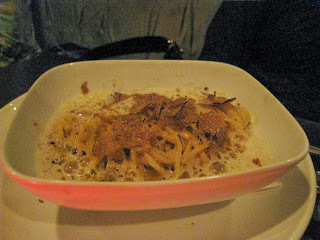 'Foodie Mentor' wisely chose the Summer Truffle Capellini in Brown Butter and Parmesan (small portion $12, full portion $18) and thoroughly enjoyed the dish. It was rich in flavor, but light and frothy in texture. Regrettably, I haven't been able to find room yet to sample the desserts - but the menu looks very tempting, with Sticky Toffee Pudding and Panna Cotta among the highlights. Maybe next time! I have recommended this place to a wide range of friends and should call out here, based on a few of their feedback, that with the current slate of customers at Waterloo & City, that it is not for a rowdy crowd (I LOVE it all the more for this, but wanted to note for those looking to have a very lively Happy Hour where people mix and mingle to a throbbing soundtrack, or are looking for a typical pub scene, not to expect it here). At the moment, the crowd skews towards the more mature - while you will see a smattering of late twenties and thirty-somethings at the bar and in the dining area, they are there usually as couples or small groups of friends/girlfriends, and outnumbered by those in older demos. This may be due to the place being relatively new, and located in a more residential area where a family diner used to be - but I expect that as more people begin to discover this neighborhood gem (along with the addition of "The Wreck Room" complete with billiards, arcade game and darts) that you will start to see more of a mixed crowd. 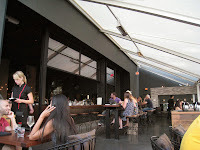 That said, Waterloo & City's Happy Hour is fantastic for the more sophisticated but laid back, people looking for good food and drinks at a great price, in an upscale but inviting space - perfect for foodies like me, and definitely my idea of the best Happy Hour on the Westside. There is still time to enter (sweepstakes ends October 15)! Grand prize includes: Two round trip economy tickets to L.A. , two-night stay at the SLS hotel (home of the Bazaar by José Andrés, where you will be able to enjoy dinner for two and one-on-one tour with the GM), daily breakfast in Tres at the SLS, signed cookbook from chef José Andrés. Plus, spa treatment for two followed by Afternoon Tea. Paradise Cove is possibly one of the best kept secrets in L.A. Hidden away off the PCH (Pacific Coast Highway, for non-locals :)) in Malibu, less than 20 miles west of downtown Santa Monica - Paradise Cove offers a family-owned restaurant and bar ON THE SAND, on their own private beach far away from the unwashed masses and wide-eyed, slow-paced tourists that clog up its more famous neighbors down the coast. I first became aware of this place through an acquaintance who makes the drive up the PCH regularly in the summer, to hit hot surf spot Zuma Beach / Point Dume. He made a comment on the drive up that he'd seen the sign for Paradise Cove many times, and always wondered what it is - so, we decided to explore on our way back, after dinner at Neptune's Net further north. The place turned out to be almost surreal - with tables and daybeds set up on the sand, next to bluffs falling away to the ocean and the hot summer night tempered by cool breezes from the water just steps away. And twinkling lights amongst palm trees adding to the charm of the whole space. You could almost pretend you were in Hawaii or some other tropical vacation destination. 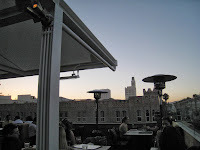 On that particular occasion, more than a year ago - we only stopped for drinks - but I remembered loving the feel of the place so much that I had made a mental note to put this in my '10 Best Date Spots in LA' file. A year and many other distracting dining experiences 'in the city' later, my 'Designer' friend happened to want to spend Labor Day at the Getty Villa (also in Malibu - well, technically Pacific Palisades, but close enough) - and that there is a ginormous seafood platter to be had for $19.95 "at some place called Paradise Cove Beach Cafe" - we quickly put the two together to make it a Malibu day trip adventure. I had forgotten that parking is only $3 for 4 hours with validation from restaurant/bar after minimum purchase of $20 ($25 if over 4 hours or without validation) - and the lot is attached to the restaurant and beach, so it was super convenient, and put us in a happy mood right from the start! We had arrived an hour before our reservation time, as we finished with the Getty Villa much earlier than anticipated. The hostess was friendly and said she would try to accommodate us, though it might be a 20 minute wait if we wanted to sit outside. The interior of the restaurant is kitschy cool, with lots of celebrity and nautical themed pictures in frames all over the walls, and of course, the inevitable nautical decor and island theme at the bar. On the other hand...there was seating outside. On the sand. Tough decisions is why we get paid the big bucks (not!) 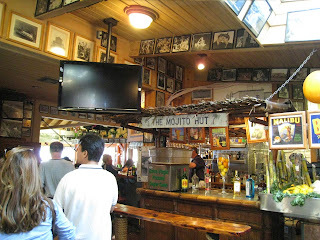 - so we grabbed hold of the lobster-shaped pager, and headed for the outdoor walk-up bar - determining quickly to pass the time with giant Pineapple Mojitos ($12 each). Though advised not to take the drinks onto the open beach, and to stay within the roped area - the venue was thoughtful enough to provide some seating for those of us who were just looking for a place to kick back until our table was ready for dinner. We dutifully found the yellow umbrellas denoting the designated area - and was happy to see that the tables were still on the sand, though further back and closer to the parking lot - and plopped down to enjoy our drinks and peruse the menu. 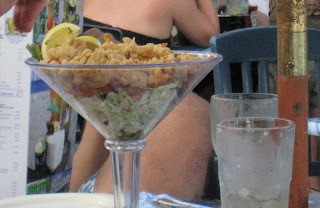 Every table around us seemed to have a giant martini glass filled with a mountain of Crispy Calamari ($15.95) as a centerpiece. It looked amazing, but far too much food for us if we wanted to save room for the giant iced seafood platters we'd read so much about! So, with superhuman self restraint, we held ourselves to just the drinks while enjoying the fresh air, ocean breeze, and people watching. And the crowd is very amusing to watch - running the gamut from local looking families, to college student couples, to girlfriends chatting over drinks and appetizers, to large and rowdy groups (the large table next to us clearly enjoyed the beach bar very much, and sang happy birthday to the girl at the head of the table throughout the night) and Jersey Shore types (of the MTV variety). I loved every minute we spent at Paradise Cove, but, the more serious-minded may not - we found it amusing that there was a guest at the bar who was so 'happy' with her various mojitos, that security traversed the restaurant to ensure the very expressive girl had someone to drive her home. Though there is a huge potential in the location and setting for a romantic dining experience - perhaps due to the very reasonable food and parking prices, accompanied by the ultra casual atmosphere and lure of a private beach, Paradise Cove attracts a broad demo. This place could be great for a first date, if your date is into a more laid back vibe - and you don't mind a little bit of unpredictability - your experience could depend on the day, where you get seated and which guests are around. It ended up being more than a half hour wait until we got seated at our table for dinner, but when the Iced Seafood Platter ($19.95 per person) arrived, the sound of drool hitting table drowned out the ocean waves and all thoughts of the lengthy wait. 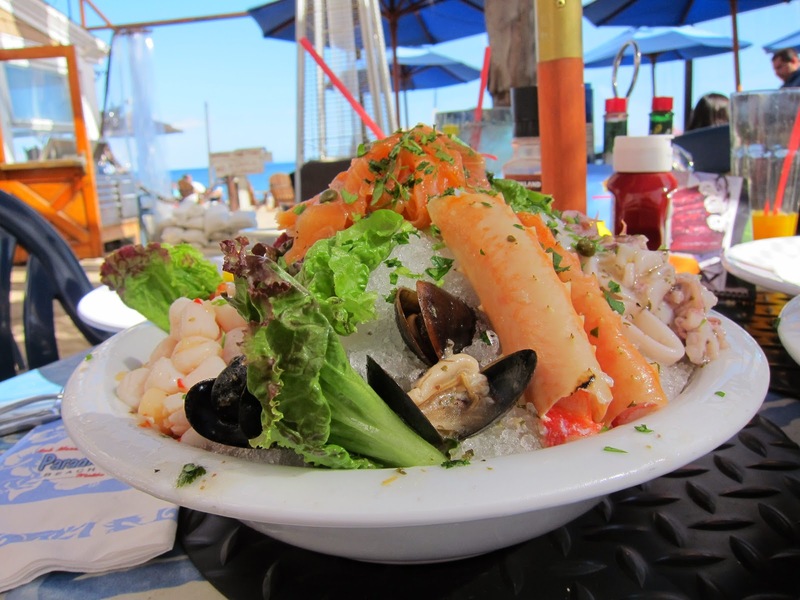 The platter served up, on a bed of ice in a giant ceramic bowl - 2 oysters, 2 crab legs, smoked salmon, 4 peeled shrimp, marinated calamari and scallop ceviche. Though not the freshest seafood I've ever tasted (it's hard to top sashimi breakfast at Tsukiji market) - it was really, really good for the price. The oysters, though not as plump as I'd like, tasted of clean, deep ocean and left me wanting more. The calamari was also delicious, at a perfect consistency - not too tough/chewy - with its light, refreshing marinade that tasted like Italian dressing. My only minor complaints were the smoked salmon, which was a little salty, and tasted like it came out of one of those vacuum sealed plastic packages you can buy at the grocery store. And the crab legs were tasty, but the shells were so soggy that they were impossible to actually crack - we ended up using our forks to pull pieces out of the shell from the ends. 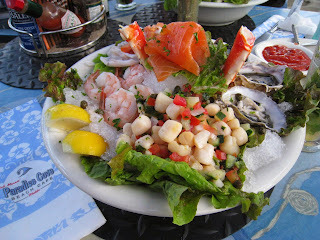 'Designer' enjoyed the oysters, but had the same comments on the salmon and crab. Though listed technically under appetizers, the platter was big enough to have for a meal in itself! We both left stuffed to the gills...but not before each ordering a bowl of New England Clam Chowder ($10) to take with us. The extensive menu also offered lots of mouth-watering surf and turf options, including mahi-mahi as well as oysters by the half dozen - reasons to come back another time. For those who don't eat seafood (blasphemy!) 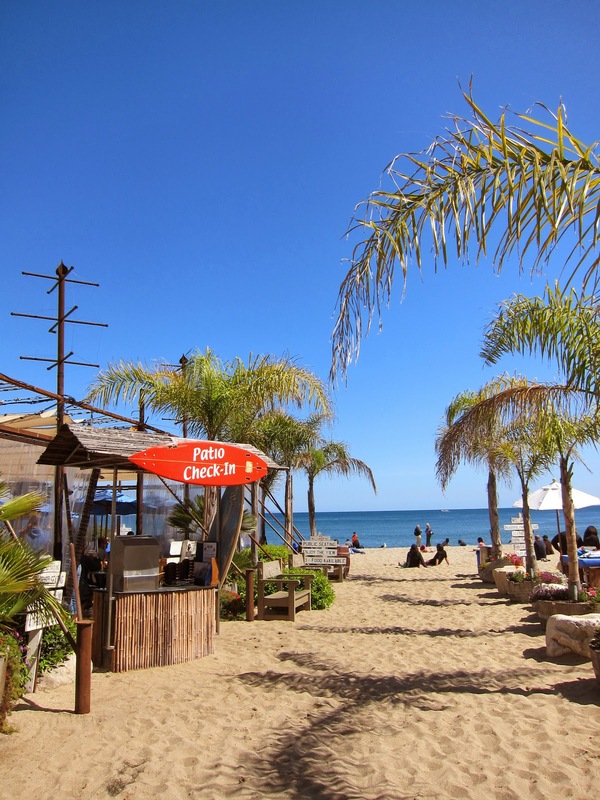 - the Beach Cafe also offers burgers and fries. All in all, the only unfortunate thing about the experience was that we were there at the very end of summer, and by the time we finished it was already getting cold - even with heat lamps turned on around us. So we didn't stay to enjoy the beach and the intoxicatingly charming space. But next summer - note to self - Paradise Cove will be my second home! Armed with an OpenTable Spotlight deal ($25 for $50) that was set to expire 4/13, Designer and I had two massive bowls of clam chowder (lots of fresh clams in every spoonful, love it! Though didn't love the cracker balls that were pre-dunked into the soup, which tasted a bit stale) and two giant iced seafood platters. Armed with an OpenTable Spotlight deal ($25 for $50) that was set to expire 4/13, Designer and I had two massive bowls of clam chowder (lots of fresh clams in every spoonful, love it! Though didn't love the cracker balls that were pre-dunked into the soup, which tasted a bit stale) and two giant iced seafood platters. This time the seafood platters did not have oysters (and oysters in general are no longer seen on the menu), but instead offered a few mussels marinated in what tasted like Italian dressing. The crab legs were much fresher, the shells were actually still firm. The smoked salmon still wasn't anything to write home about, but hey, we were getting essentially one of the platters and a glass of OJ for free with the OpenTable Spotlight deal so we weren't going to complain. Designer took the salmon home to mix with cream cheese for breakfast. 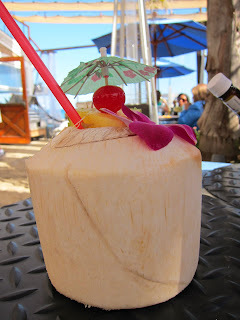 I also filled up on the Ice Cream Cocolada, served in a coconut shell - that made me feel even more like I was on vacation! Although not a true foodie destination (I don't go home and dream of the food, but I do dream of the ambience / experience! 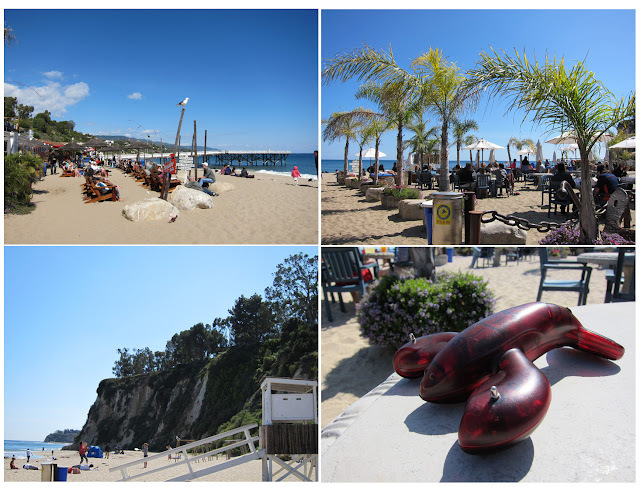 ), Paradise Cove is still definitely worth the drive out for drinks or just to chill on the beach and pretend, for just one afternoon or hot summer night, that you are in some tropical place far away from the daily grind in LA. Prepared to fully enjoy every minute of the last weekend of summer, and the last long weekend before the holidays, to the fullest - I had been excited to see the inaugural Los Angeles Times Celebration of Food & Wine event set for Sunday, and really wanted to like it and hoped for it to be an event to look forward to every year. Unfortunately, it ended up being a complete rip-off, and had I paid full price (luckily, my 'designer' friend and I had purchased discounted general admission tickets through Goldstar Events for $39 with fees, versus $65 at the door) - we would have been even more disgruntled. The concept was great - a general gathering of restaurants, food trucks and wineries / beverage companies to allow for a pleasant day of sampling on the backlot of Paramount Studios. Marketing - most people we talked to at the event were just as confused as we were, as to what would be included with the price of the admission ticket. Based on event communications, we thought for the high price of admission, there would be plenty of food - with the majority of booths offering free samples, and select vendors offering food for purchase. We arrived at around 1:30pm and were extremely disappointed to find that there were only maybe 8-9 vendors that actually offered free food (bite-sized samples of Voskos greek yogurt, Kyocho fried chicken, korean pancake, calamari from Tantalum, La Brea Bakery bread and Kerrygold cheese, cake balls, curry and thai pancake, strawberry buttermilk gelato). Though we shamelessly went several rounds at each of these booths, it was definitely not enough to be filling. We did hear of a 'Hoy Cantina' which supposedly served a mexican buffet that only cost one drink ticket, and had a fun mariachi band performance in the space - but they ran out of food very quickly and we never got to experience it. (And again, communication was an issue here - the fact that 'drink tickets' could be used to redeem food in some places, but not others, was confusing). The Gorbals / Fiji station also offered bacon-wrapped matzoh balls, but as it was sort of hidden inside a small storefront built into a facade building, so we didn't see it until around 5:15pm by which time they had completely run out of food. (Not) dealing with the heat: It was a sweltering day - the event started at noon and very little if anything was done to provide more shade or cooling/ hydration stations for guests. They could have easily taking a cue from Vegas and set up misters, fans, water stations or even more canopies, umbrellas or tents to provide shade. The only water that was provided to guests was at the Fiji 'cafe', which had long lines, and a real estate agent's booth (water source unknown). We skipped all of the demonstrations / panels as seating was all out in the open with the sun directly overhead. It was difficult to enjoy the event overall as we felt overheated and dehydrated most of the day, between standing in long lines, weaving our way through crowds and trying to sample as much alcohol as we could handle to get our money's worth. Limited seating: there were only a handful of tables provided outside the Gorbals/Fiji station for people to sit and eat their food or rest. Everyone else either ate standing up or sitting on the curb or steps (which by the way were riddled with bird droppings) while trying to juggle their purses etc. Food trucks not included with admission: The major complaint on this one is that we still had to pay for food from these trucks on top of the admission ticket price, and the small selection of food trucks at the event was not even that impressive. If I wanted to sample food trucks there are a number of events around the city I could go to for free (e.g. Abbot Kinney First Friday, Unique LA, Downtown Art Walk etc.) - which offer greater numbers and variety of food trucks in one place, and I would pay only for whatever food I choose to buy from the trucks anyway. 'Designer' had also recently gone to a festival that specifically offered a collection of food trucks for sampling - and paid around $40 for a day of all-you-can-eat at any of the food trucks at the event. So for the LA Times event, since we had to pay for individual portions of food from the trucks anyway, the food trucks really did not add any value to the price we paid for our admission tickets. The VIPs seemed to have a much better experience, though the number, and - with a few notable exceptions - the caliber of the majority of the exhibitors were not even in the same league as some of the other more upscale foodie events around LA. For $125, I would much rather go to Taste of Beverly Hills, or Taste of the Nation event in Culver City - both of which offers sampling from restaurants that are truly haute cuisine. Another component of the event that was supposed to be a highlight, a concert performance by She and Him (love Zooey Deschanel!) - also proved to be underwhelming. We sat through only the first few songs - the acoustics were so poor that we couldn't hear much of what she was singing. Communications about drink sampling were fairly clear - and the 8 drink tickets were generous and more than enough. Plenty of alcohol was on pour, from wine, rum, Veev acai vodka to Korean soju and Japanese sake. It was a great experience walking around checking them out and sampling. A lot of the alcohol vendors did not even bother to collect drink tickets, so we left with over half of our drink tickets still in our pockets. Izze gave out unlimited samples of a large variety flavors of their sparkling fruit juice - this kept us hydrated throughout the day and possibly saved our lives. Sedthee Thai: awesome curry and thai pancakes made fresh on site. One of the best free food samples at the event. Kyocho Chicken booth: Great samples of fried chicken, and event marketing done right. They had a prize wheel as a fun activity integrated with their sampling tactic - and everyone wins a prize that is clearly marked with restaurant branding, that they can carry around in a handy shopping bag that was handing for storing your drink glass (to leave your hands free for more sampling!). Making new friends: all the negatives of the event helped bring people together - strangers bonded while in the seemingly interminable lines, exchanging tips on where to scavenge the coveted free food samples; showed their humanity in squeezing over in the limited shade to save just one more person's life from the heat; guided others to booths/ bathrooms where volunteers failed to be helpful. Parking: Since the event was on a Sunday, street parking was free - so we were able to avoid the crowds (and the confusion that we heard that many guests experienced while trying to park on the studio lot) by snagging metered parking on Melrose just west of Larchmont. It was an easy block and half walk to the event entrance. Knowing that the first time is always tough, and that the organizers will hopefully take many learnings from this year's event - unless they drastically lower the price of admission, increase the number and quality of exhibitors giving food samples, and get much better organized next year, I for one will definitely not be planning to attend this event again - and judging from the reviews online, many others are likely to join me in deciding to pay just a little more for a much better experience with Taste of Beverly Hills instead.